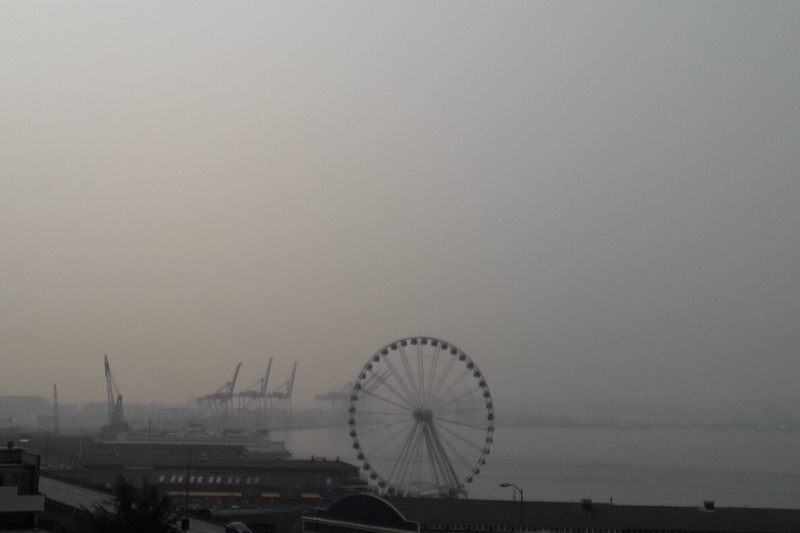 Seattle has the worst city sky in the world now, according to my news feed lately. That’s probably right, according to my lungs. There is much smoke in the air now, mainly from wildfires to the north of here in the Cascades region and Canada. The Air Quality Index had the height of the latest round as a unhealthy hazard at 220, which I read is like smoking 7 packs of cigarettes. This might explain why I feel so very relaxed lately. Right now, the smoke is applying a filter to the partially visible Moon, giving it an eerie red glow. I tried to leave my window open, to let in some nightly air, but ugh…still not good. My small apartment will remain musty for now, as I now go for an extra helping of Chocolate Cherry Bordeaux ice cream. This is not how I imagined my future, but it’s how I must live now. Tomorrow, I hear the smoke will partly thin out. That’s good, and hopefully an end to this third sequenced year of the mass smoky blanket of hell, rudely interrupting my summer. And then, I think I will appreciate the return of a good clear day, much more. Posted on August 22, 2018 by Orion T.	This entry was posted in Phone shots, Photography, Seattle and tagged PNW, Seattle, smoky skies, summer 2018, waterfront. Bookmark the permalink.